Review: “A rush of power surged over him. Luke never felt so much in control as when there was none, when all that existed was Luke and the air and the inevitable stop at the end. It was all up to him in those moments. He had decided that he was going to jump and that he was going to land in the water below, and there was absolutely nobody that could stop him. 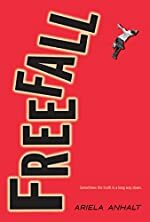 He had all the power.” Bringing suspense and truth to the next level, Freefall (written by Ariela Anhalt) is a wonderfully crafted art that will last for many years to come. What could possibly be more agonizing than witnessing the death of a student? A trip to Luke’s mother’s house? Before becoming best friends with Haden Applegate, Luke is barely known by anybody. It is because of Haden that people even know Luke’s name. For both of them, fencing is the most important thing in the world. Each of them practices every day, finding time out of their busy homework schedules to get better than the day before. Haden of course is the leader of the team. All things must end sometime and that happens when Russell comes into the picture. It does not matter to Haden that Russell is better than everyone on the team except for himself. Russell and Haden hate each other from the very beginning and have no trouble admitting it. Drunk driving, girls, and fencing are now the least of his worries as Russell dies and Haden is to blame for the crime. From here, Luke must make a choice from what he saw that night. Will Luke be able to defend his friend or will he go against him? Just like the cover explains, “Sometimes the truth is a long way down”. Mind boggling. Heart breaking. An outstanding book to the end of its fall. Freefall is a perfect example of a troubled teenager who in the end realizes who his true friends are and that the right thing to do is to forgive his mother for what she had done. I rate this book five stars because of the unimaginable detail and description. I felt like I could see through Luke’s eyes, seeing everything that he sees. I would recommend this at the reader’s book 13 and up because of its swearing. This is not a drawback of the book, but makes it more mature for older readers. My favorite part of the book was most likely the tension that never seemed to cease for Luke. I myself have found connections with Luke that I thought were quite interesting. At the age of just 14 years, Ariela was starting Freefall. Her imagination must be incredible to have come up with such a remarkable manuscript. I have no doubt that Ariela Anhalt’s fame will only increase. Good minds like hers will definitely shape the reading world of the future. We would like to thank Houghton Mifflin Harcourt for providing a copy of Freefall for this review. Have you read Freefall? How would you rate it?